An ordinance to establish a procedural order in city council meetings met some resistance from council members at the Trumann City Council's monthly meeting this past Tuesday at the courtroom at the Judicial Complex in Trumann. The first item in new business was the ordinance to establish the schedule for the city council meetings, setting the agenda items, approval of proposed agenda items, organization of council meetings, and for other purposes. The sections of the ordinance were: who the city council consists of, council meetings, regular and special meetings, setting agenda items, approval of agenda items, reports from council members, proposed agenda items-legal matters, public comment-limitation of timing, attendance at council meetings, order of business, and an emergency clause. After the ordinance was read, council member Stephen Hammell asked if two minutes was long enough for public comment and why one had to have a request in to be on the agenda ten days prior to the meeting. Mayor Barbara Lewallen said the two minutes was for the individual to say what they were speaking about and then it would be open for discussion by the council. She also told the council that the ordinance had not been voted on, so changes could be made to if need. Miller also spoke about the time limit, saying they allow ten minutes in the Jonesboro meetings. Questions were also asked about how late the council members get their agenda packets before the monthly meetings. Miller said getting the packet on Friday and then the meeting on Monday does not give him enough time to visit with his people of Ward 3 about the issues. Hammell said possibly getting them by email would be better. Lewallen said that could be an option. Miller also asked if a council member could ask a person in attendance to speak on issue. Lewallen referred to attorney Tom Haines who said that yes, they could, but it would have to be made in a motion and then voted on by the council before they were allowed to do so. Miller proposed the ordinance be sent back to committee for possible changes. The council voted to do that. In other new business, an ordinance was passed to change the zoning from A1 to R1 on 18.71 acres of land east of Balcom, north of Nancy and west of Dwight Streets for a possible new sub-division. The Great American Cleanup in Arkansas has been set for April 22-26. The AML 85th Annual Convention is set for June 12-14, Lewallen said to let Chicki know if any council members want to attend. The mayor read a proclamation proclaiming as National Safe Digging Month. It is urged that you call 811 to check for underground utilities before you dig. 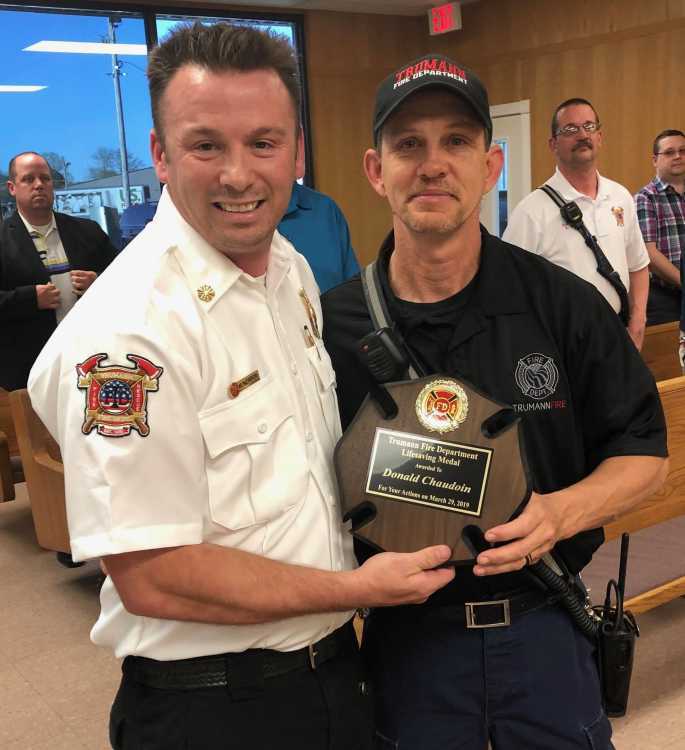 The only department to report was from Trumann Fire Chief Revis Kemper who presented an award to Fireman Donald Chaudion, whose quick thinking of applying tourniquets to a man's legs after a vehicle-pedestrian accident on March 29 saved the life of the man who was hit. Kemper also reported that the department had 75 calls in the last three weeks, mostly medical with a few grass fires and five structure fires. The department rescued five cats and two dogs too. The department also assisted with a recovery on April 7. In ward reports the only council member to speak was Matt Miller in Ward 3. He said he had a complaint about the Trumann Police Department not wanting to send out Animal Control on a stray dog. Miller said he hadn't had time to speak to Trumann Police Chief Chad Henson about the issue. Miller also said he had complaints about the tornado sirens not working. Kemper said one siren is obsolete and will need to be replaced, and the other siren had been worked on but needs to be checked by the company who makes them. A new siren is around $25,000. Miller said he has contacted Rep. Johnny Rye and Senator Dave Wallace and asked if there is any way to get financial help in the matter. Miller also had a complaint about a yard on Birch Street in which he said he talked to the owner about getting the yard cleaned up. He also said there are six street lights out in his ward. Mayor Lewallen asked Miller to get a list to Chicki Inboden at city hall to have those fixed. Stewart said he has some calls about ditches needing to be cleaned out on Byrn and Blanton.